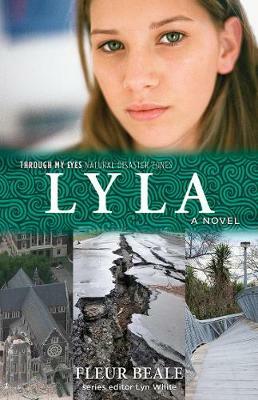 A gripping and personal story about one girl's experience of the 2011 Christchurch earthquake and its aftermath. Lyla has just started her second year of high school when a magnitude 6.3 earthquake shakes Christchurch to pieces. Devastation is everywhere. While her police officer mother and trauma nurse father respond to the disaster, Lyla puts on a brave face, opening their home to neighbours and leading the community clean-up. But soon she discovers that it's not only familiar buildings and landscapes that have vanished - it's friends and acquaintances too. As the earth keeps shaking day after day, can Lyla find a way to cope with her new reality? Fleur Beale is the author of many award-winning books for children and young adults - she has now had more than 40 books published in New Zealand, as well as being published in the United States and England. Beale is the only writer to have twice won the Storylines Gaelyn Gordon Award for a Much-Loved Book: with Slide the Corner in 2007, and I Am Not Esther in 2009. She won the Esther Glen Award for distinguished contribution to children's literature for Juno Of Taris in the 2009 LIANZA Children's Book Awards. Fierce September won the YA category in the 2011 NZ Post Children's Book Awards and the LIANZA Young Adult Award in 2011. In 2012 she won the Margaret Mahy Medal for her outstanding contribution to children's writing, and in 2015 she was awarded the New Zealand Order of Merit for services to literature. In 1999, Beale was Dunedin College of Education's Writer in Residence. A former high-school teacher, Beale lives in Wellington. Series editor and series creator Lyn White has extensive experience as a primary school teacher-librarian and EAL teacher and in 2010 completed postgraduate studies in Editing and Communications at the University of Melbourne. Lyn is passionate about children's literature and has great expertise in engaging students with quality texts. Her work with refugee children motivated her to create the acclaimed Through My Eyes series of books set in contemporary war zones. Lyn created and edited the Through My Eyes - Natural Disaster Zones series to pay tribute to the courage and resilience of children who are often the most vulnerable in post-disaster situations. Lyn continues to teach EAL and is an education consultant and conference presenter.